Today I bought a denim vest. H&M told me I needed a denim vest, and so I bought the denim vest. 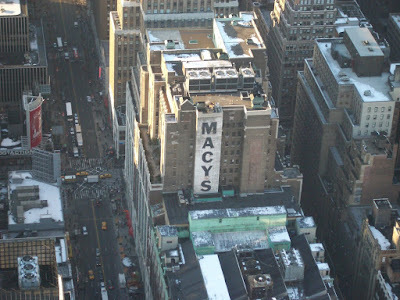 I also went to Macy's today in Herald Square. The only other time I'd been to Macy’s was on my 15th birthday, which happened to fall on Rosh Hashana that year, and since Jewish holidays are awesome and we lived on the East Coast and always had the Jewish holidays off, my mom and I got to spend the day wandering around the city eating bagels. Another thing we did that day was see David Letterman, thus beginning my lifelong crush on crusty old men. Also, we went to Macy's. The very greatest thing about Macy's is that when you take the escalator up and up and up, right around the 4th floor the elevators turn wooden. Today I really wished I was with my mom because we'd have had a great time shopping together, and one of the few rough things about living in this city is how rarely I get to see to my momma. Macy's is one heck of an experience when you're by your lonesome. So on this wonderful President's Day I give thanks to Washington and Lincoln for giving me this day off so I could spend an entire six hours in the sales racks, surrounded by the people in this world who love me most: retail employees.